The late summer stretch of five straight away games was always going to test the Loons. With three down, it’s been a failing effort so far. A two week break to recoup and get healthy before the road trip’s two most winnable (on paper at least) matches is welcome. But what evidence do we have to expect things to get better? First off, an apology to readers of these articles. Last week’s loss to FC Dallas, after a rain delay that lasted over two hours, was so dreary, I couldn’t bring myself to write about it last week. If I hadn’t felt an obligation to cover the match on Twitter for @FiftyFiveOne, I would’ve just gone to sleep and missed the game entirely. With a starting XI so plainly ineffective, the result was obvious from the start. I could’ve probably taken the same approach on Saturday night, when the Loons traveled to The Speedway to take on the Sporks of Kansas City. The return to the 3-5-2 was welcome, but without Darwin Quintero for the second straight week, the team had little success, falling 0-2 for the second straight week. It was a better effort, but not by much. The Loons again simply looked outclassed. As the season heads into the home stretch, the gulf between the teams who are organized and committed to a philosophy of playing, and those who are not, seems to grow wider. After the Dallas match, Head Coach Adrian Heath acknowledged that fact, saying the result was “another reminder of how far we have to go,” and “we’ve got to get a lot better.” It was all a true statement, but also a stunning one, given that he has been the man in charge of getting the team where it has to go and making it better for over a year and a half. Loons fans have been hearing the same platitudes for that entire time, and they are no less true than the first time they were uttered, which is quite damming. In contrast, 2018 expansion club Los Angeles have fourteen more points than the Loons with twelve more goals scored and twelve fewer goals conceded. Head Coach Bob Bradley has managed to get the best out of a series of strikers, is playing without a dedicated defensive midfielder, and has his team playing well despite a number of major injuries and international absences. There are clear parallels with Minnesota. Yet that entire LA team has bought into a philosophy of play that makes them one of the league’s more entertaining sides. The Loons have not. It’s also true that LA have far to go, and could stand to get a lot better. But they’re already far ahead of Minnesota, and in far less time. The constant excuses, hand waving, and blame shifting from the Loons’ front office will surely have run its course by the time that this road trip is through. 5. Only one player distinguished themselves against Dallas and that was surprise starter Frantz Pangop. His quickness on the dribble created the Loons’ best positions on the night. Unfortunately his crossing and shooting was beyond horrible. Then, after starting one week, he didn’t even make the eighteen against Sporting KC. Huh??? 4. Midweek, Minnesota signed Brazilian defensive midfielder Fernando Bob who last played in November of 2017. He is 30, and has had a nomadic career in the Brazilian top flight. This is the kind of signing that I would’ve been thrilled with in the NASL. But for an MLS club about the miss the playoffs, it’s all kinds of weird. 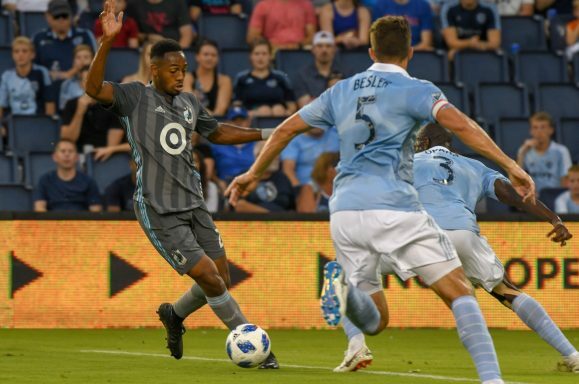 The Loons have no need for veterans to bolster the team down the stretch. The Loons have a need for young talent to build upon. Twetny-three year-old Brazilian defensive midfielder Maximiano is already on the team, but cannot get playing time despite the club conceding two goals per game. He needs a run of starts to determine if he is worth investing in for the future. Also twenty-three is Collin Martin, who has gotten some more time this year, but never really been a consistent part of the line-up. He also needs time to play. Instead, week after week, the midfield trio of Collen Warner, Ibson, and Rasmus Schüller goes out, and week after week they are losing the midfield battle. It’s well past time to play the team’s relatively younger players, see what they can do, and determine the extent of the midfield overhaul that this offseason must surely bring. 3. Ángelo Rodríguez mustered a couple shots on goal and a good run on Sunday, but he already cuts a frustrated figure at the head of the team’s attack, and has now played 336 minutes for the Loons and is yet to score. It can take players a while to adjust to MLS, especially those who have spent their entire careers in a different league, and certainly those who start their MLS careers with mostly road games. That’s one reason why the trade of Christian Ramirez seemed (and still seems) so suicidal. But it happened, and it served to put more pressure on Rodriguez, and the Loons have to see more from him. In a substitute appearance, Abu Danladi looked far sharper and more active, either than Rodriguez or the player he replaced, Mason Toye. Who knows what Danladi did to earn the ire of Heath, who publicly snubbed him for a substitute appearance in Dallas and a start in Kansas City. But it remains true that Danladi is the only striker on the team to have scored in MLS, which is an ability the team desperately needs right now. Overlooking the Ghanaian makes less sense now than ever, and as long as he is healthy, he probably ought to be starting. 2. The team has absolutely no plan of attack without Darwin Quintero. Hopefully the club’s two week break will allow the dynamic Colombian to return to fitness. But if not, the Loons ought to use the time to figure out how to play attacking soccer without him. It’s clear the team has come to play around their first ever DP, and that’s natural to a point. But it has clearly become reliance. Whatever attacking philosophy the club used to have before Quintero joined is long forgotten. This is yet another one of those times when I throw up my hands and wonder what is even happening in the team’s practices. When Adrian Heath was hired as head coach, people like Jamie Watson spoke highly of his “system” which supposedly led to great attacking teams. But a year in a half in, and that system is nowhere to be seen. Either it doesn’t exist, it isn’t very good, or the team is in open mutiny against it. Without the singular magic of Quintero, the Loons needed more than ever to be on the same page and have a theory of how to attack. That they haven’t shown much of one is frankly unbelievable. 1. Quick hits. Bobby Shuttleworth had a really bad game against Kansas City. It’s been rare that he’s been so poor this year, but it feels as though his second half of the season has been a bit of a regression to the mean, after an incredible first half… … With Francisco Calvo and Michael Boxall suspended for the next match in DC, surely there is no other option but to finally give Wyatt Omsberg some playing time. Hooray!… …In other centerback news, on-loan Cameroonian Bertrand Owundi Eko’o was absolutely awful in his second game for the Charlotte Independence, who lost 6-2 to North Carolina… …The other Loons’ loanee, Carter Manley, finally got on the field for Las Vegas Lights, in a 2-2 draw… …Why is Alex Kapp still not getting a loan?